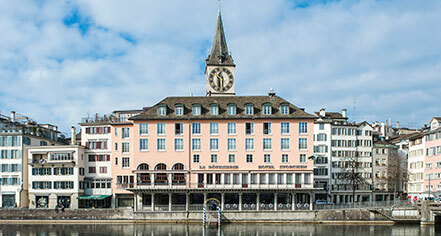 From the regal black storks nesting in the eaves to the leisurely flow of riverboats just beyond the terrace cafe, Storchen Zürich - Lifestyle Boutique Hotel is the only Old Town Zürich hotel located directly upon the river Limmat. Renowned for warm hospitality for over 660 years, this historic treasure provides an ideal location for gracious accommodations and efficient service. Nestled in the heart of the city center, this boutique hotel is mere steps from cultural landmarks, including the famous Zürich Opera House, one of the world’s most celebrated neo-baroque opera venues. In addition to its prime historic location, Storchen Zürich’s traditional appointments and luxurious accommodations combined with their impeccable service and superb hospitality have distinguished this timeless hotel as a first-class establishment and a truly cherished address. Indulge in the variety of on-site dining options with a range of exquisite cuisines and atmospheres to suit every palate and situation or choose Storchen Zurich as the location for important banquets, meetings, receptions, or other momentous events. Between sharing friendly interactions with the attentive staff, sipping a cocktail in the sophisticated Storchen Bar, or unwinding in the elegant lobby after a day of exploring the city, guests will be glad to call Storchen Zurich their Swiss home away from home. Most of Zürich's historic and cultural sights lie within the compact area surrounding Storchen Zürich on either side of the River Limmat, between the Hauptbahnhof and Lake Zürich. The churches and burgher houses of the Old Town are clustered here, as are the elegant shops of Bahnhofstrasse. Also within strolling distance of the hotel are the city's most impressive churches, the Grossmünster and Fraumünster, as well as the city's oldest, St Peterskirche, which still boasts the largest clock face in Europe. Storchen Zürich - Lifestyle Boutique Hotel, a member of Historic Hotels Worldwide since 2011, dates back to 1357. Legend says that "zum Storchen" received its name from a rare black stork that was breeding on the Storchen’s roof. Adjoining Rooms: Please notify request at time of booking. Airport Transportation: 24-hour airport shuttle is available; CHF 150 (one way). Please contact the property in advance to get details. Deposit: Credit card deposit required at check-in for incidental charges. Hotel/Resort Fees & Taxes: A city tax is imposed of CHF 2.5 per person, per night. Additional taxes or fees may apply. Parking: Self-parking: Not available. Valet parking: Available; CHF 50 per day. Rollaways: Available upon request; CHF 75 per night. From the regal black storks nesting in the eaves to the leisurely flow of riverboats just beyond the terrace cafe, Storchen Zürich - Lifestyle Boutique Hotel is the only Old Town Zürich hotel located directly upon the river Limmat. 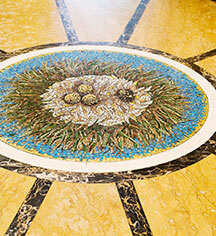 Learn more about the History of Storchen Zürich - Lifestyle Boutique Hotel .